“There are winged horses that live in the mirrors of Briar Hill hospital—the mirrors that reflect the elegant rooms once home to a princess, now filled with sick children. Only Emmaline can see the creatures. It is her secret. One morning, Emmaline climbs over the wall of the hospital’s abandoned gardens and discovers something incredible: a white horse with a broken wing has left the mirror-world and entered her own. Brittney Joy’s Review ~ Wow… I didn’t expect this book to sneak up on me like that. I read a lot of YA, but I rarely pickup a middle grade novel. On top of that, I shy away from historical settings because they are a little too close to reality for me (and sometimes, reality can be scary). I read a review of this book on a blog I love (Liber Destella - checkout Sara’s blog because it’s awesome) and I added it to my GoodReads to-read list where it stayed for nearly a year. Then, around Christmas time, I noticed that the audiobook was available through my library and I downloaded it. It immediately sucked me in and grabbed my heart. The Secret Horses of Briar Hill is set in WWII at a children’s hospital filled with sick kiddos. Sounds depressing, right? It’s not. This book is filled with hope and magic and determination. I immediately fell in love with the main character, Emmaline, who can see winged horses in the mirrors. She’s convinced she’s the only one that can see them and the only one that can save a certain winged horse that is hiding in her world, outside the mirrors. This book reads like a classic and I really enjoyed the audiobook’s narrator. The narrator has a British accent, but it’s not overpowering. I’ve listened to other audiobooks where a narrator’s accent is distracting because it’s hard to understand what they are saying, but that wasn’t the case with this audiobook. The narrator’s British accent added to the story. Actually, it felt like Mary Poppins was reading me a book at bedtime. I loved it! I flew through this book, enjoying the world as it unfolded. 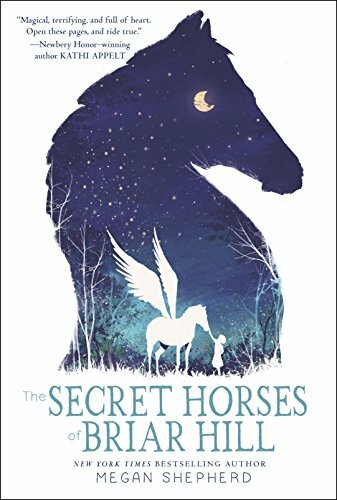 I loved how the winged horses were incorporated because they were symbolic to what was happening in Emmaline’s real world (in the hospital). This book pulled at my heart strings as I rooted for the brave main character, her sweet friend Anna, Thomas the secretive & caring gardener, and Foxfire the broken-winged horse. I’d suggest this for anyone 11 years+ as there are some tough subjects (death), but ultimately this story is one of bravery, determination, and magic (unseen and that of the heart). Bonus: In the audiobook there is an author’s note at the end which explains where Shepherd got her inspiration for The Secret Horses of Briar Hill. She notes that the inspiration was very personal for her because (during her research of WWII & childhood illnesses) she discovered memorabilia, letters, and photos from her grandfather’s time in WWII. In one of his letters, her grandfather noted the importance of finding beauty in the darkness of war. This struck Shepherd and that is what she wrote about in The Secret Horses of Briar Hill … finding beauty in a dark place. LOVED. ONE OF MY FAVORITE READS OF 2018.